Eureka - Joe Ream School. Teacher: Dorothy Worrell. 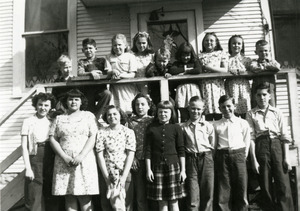 Front row left to right: Dolores Worrell, Doris Cilek, Betty Cilek, Mary Jean Slofer, Stahle, David Theurauf, Howard Mottet, Bernard Slofer. Back row left to right: Paul Theurauf, Jim Leonard, Stahle, Mottet, Jr. Koss, Elaine Leonard, Ms. Koss, Ms. Koss, Jerry Stahle. “Cedar #4 School ,” Iowa City Public Library, accessed April 24, 2019, http://history.icpl.org/items/show/1582.